Some kitties prefer using your furniture rather than their scratching post. 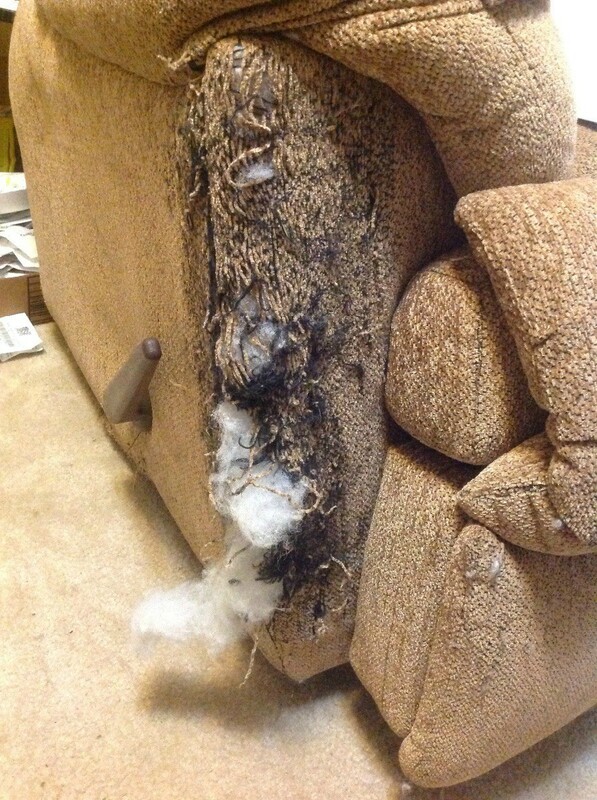 Should this happen to your furniture you have a couple of choices, one is to search for a cover for the piece, or if you are up for the task you might try to patch the area with new upholstery. This is a guide about repairing recliner upholstery that was destroyed by a cat. How do I repair the upholstory on the arms of a recliner where my cat clawed them? Please see photo of chair arm below. Is it easier to repair/recover? This may not be an easy repair and unless you are really good at this sort of thing - it may not be very attractive. If you are willing to live with that, I have a few suggestions. (Before you start - try to smooth the damaged material/stuffing back into the area/material). I know this will work (maybe my instructions are passable) because I have done this myself. It does not look like the area is one that moves so you may be able to just cover it with a similar type of material. Many Walmart type stores or craft stores sell similar upholstery material and it can be purchased in 1/2 to 1 yard pieces. You will also need heavy duty thread and an upholstery or canvas needle (a heavy duty hooked needle works well). Measure your damaged area and buy a piece several inches larger. Lay the material over the area and cut to size, leaving at least 1-2 inches all around the outer area. At this point you can hem the repair piece or just start at the top and fold extra material under and sew/attach to your good/undamaged material. Just attach/work/sew all the way around the damaged area. This will work but you may have to also sew across the material in several places to make the material tighter and not bulge. Spray the new material with cat repellent. There are fitted covers for chairs and sofas. They come in different colors and patterns. I would buy that. You're not going to be able to repair this inexpensively. If you don't mind on the looks. I'd patch it up. Then put a throw blanket to hide the patch.